Fall is here, and I have to tell you, I’m very excited about that fact! Fall is my absolute favorite time of year. All those pumpkins, turning leaves, apple harvests, burning fire places scenting the air outdoors and all those warm, comfy sweaters put me right in my element. There’s no better time of year to be in the kitchen, creating some warm and wonderful comfort food! This soup may very well be one of my new favorite comfort foods too! It’s thick, a tad creamy, bursting with curry spice, and oh so warm and cozy in the tummy. I served this with some Clean Eating English Muffins, and for the 15 minutes it took me to eat a bowl of this deliciousness, I was in shear, elemental heaven. Place all ingredients into a large soup pot and bring to a medium boil. Cook at a medium boil until the apples and sweet potatoes are soft. 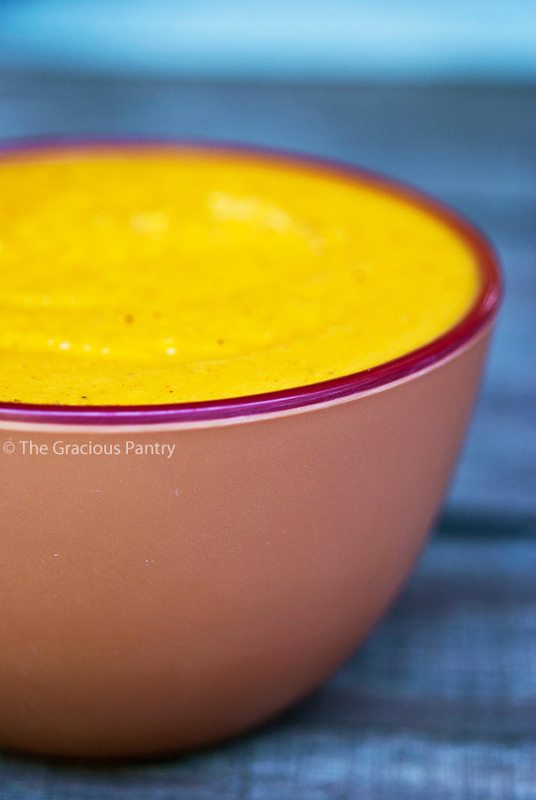 Using a hand blender, blend the soup until smooth directly in the soup pot you just cooked it in. If you don’t have a hand blender, you’ll have to transfer the contents to a regular blender a little at a time. Be careful, it’s hot! Jenn – You’re welcome! Hope you enjoy them! This sounds delicious! I made a butternut squash soup the other night that I think could be one of my new favorites! I love a good vegetable soup this time of year. One that is over loaded with fresh veggies! Hillary – Yes! Butternut is FABULOUS stuff! Rachelomera – I’m glad this is something you can have! Hope you enjoy it! Made this and it was delicious! Michaelaplant – Glad you enjoyed it! en thed weather turns chilly I want soup. This looks luscious. Jodi – It is! Enjoy! Oh dear. Feel free to edit my typos. Jodi – Haha! No worries. I find a lot of typos in my own stuff here as well. I made this today. It came out really good. I am going to freeze some of it into single servings. I can just grab one and bring it for lunch at work. Yummy! I could not find light coconut soup so I had to whole coconut milk. Ktab – Glad you enjoyed it! This is soooooo yummy! Just wondering… I’m trying to enter the recipe info into MyFitnessPal, and I can’t figure out the nutrition information for 3 lbs of sweet potatoes. How did you figure it out? Because all my calculations give me WAY more calories per serving of soup than you have listed. Thanks! Hmmm…. I entered it into nutritiondata.com. It’s possible there is a big difference between the two. I’m finding that these calculators are not very reliable at all. Double check your measurements on MFP and if they are right, then I would go with that. They tend to be a bit more accurate. I found this on Pinterest and made it tonight. It was delicious! Thank you. As a recently diagnosed kidney patient, I freaked a little about what I could now eat. Most of my recipes are going to be hard to adapt to my new eating requirements. Although I need to eat sweet potatoes sparingly, a cup of this loveliness won’t affect me. It’s simmering on the stove right now, making the house smell wonderful. Thank you! I just made this soup in my Blendtec and it is AMAZING!! Kelley – Wonderful! Glad you enjoyed it! I made this soup yesterday, and it was light and delicious. Love the combination of spices! Since October, 2013, I have made this recipe once a month. I freeze some of it, yes, even with the light coconut in it. This is a very delicious and healthy recipe! Omg…this was ah-mazing…i omitted the nutmeg and added a bit of cinnamon…cant wait to make again on a snowy day…yummy to my tummy! Made this today for my vegan daughter-in-law who is visiting. As with most yhings I make for her, they quickly make it to my favorites list! Right up there with my carrot ginger soup! Made this in the slow cooker yesterday and it turned out great!!! Love the curry spice. I veganized this with vegetable broth and it was super easy and delicious!! Perfect for this snow day. Thanks for the recipe!! TappinTamara – My pleasure! Glad you enjoyed it! I’ve been making this for about 3 or 4 years now, I think. It has become my favourite soup recipe. Delicious!